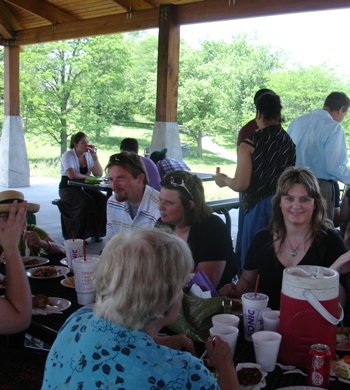 This Sunday our church had a picnic at the park. 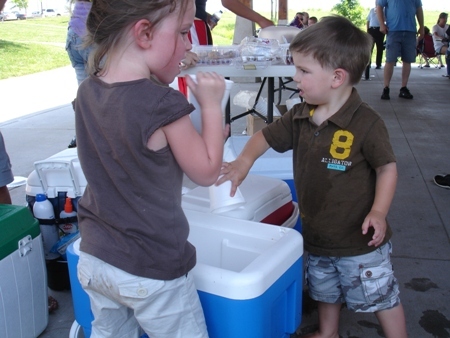 The weather was hot, but the food plentiful (the church supplied fried chicken and everyone brought a dish). Everyone enjoyed getting together with friends, eating, laughing, and talking. Here I am with my dear, precious friends Kenny and Kelly. Kelly’s mom is in the blue shirt and has her back to the camera. By Kenny on the left is my dear friend Joy, in the cute hat. 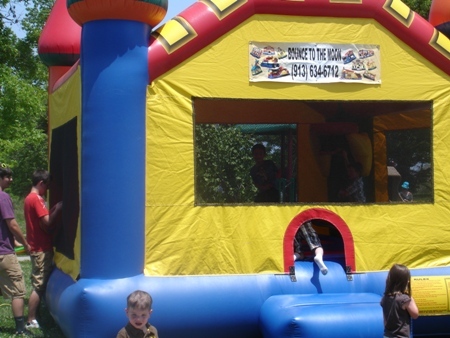 The kids loved running around and bouncing on the “bouncy thing.” (I don’t know what the technical name for it is!) Kenny and Kelly have 8 beautiful kids (yes, eight), and in this pic you see their son River and their daughter Selah (I LOVE their names!) by it. Here is a close up of Selah and River. River kept himself cooled off and also entertained by digging into the ice chest, and throwing ice cubes and the melted water out of the ice chest onto the concrete floor under the shelter. This pug-boxer mix dog belongs to Elliott and Joy. Joy is the daughter of Pastor Bill and Pastor Laurie, and Elliott is her husband. Joy and our daughter Leah walked around the park, and when they got to the end of the walk, the pug just laid down on the floor, legs all stretched out, with his big tongue hanging out. 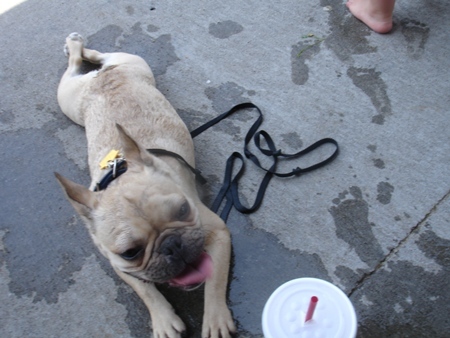 He was really hot, but after some water and after he laid by the fan we had going under the shelter, he cooled off. It’s so important to be able to to find a house of God where you can worship and praise God, receive sound Biblical teaching, receive prayer, pray for others, use your spiritual gifts. If you have kids or teens, it’s also very important to find a church that has a good children’s or a good youth group program. I encourage you to find a church whose leaders believe in the spiritual gifts and allow people to use their giftings (men, women, children, and teens – God wants to use everyone NOW!). Have you found that place yet? Pray and ask God to help you. It may take some time, but it’s worth it when you do find it, even if you have to drive a long distance to get there like we do. God doesn’t want you to feel isolated and alone, but to be in His presence and to have the support – and the accountability – of being in the Body of Christ. Candie, I bet that was hard. So glad you have a new church home. It was hard on us when we were looking for a new one, because we had been in the previous church for 12 years and it was our family! But when God says to go and move on, we need to obey! 🙂 I am thankful for God’s leading and provision. We all need each other! My family has recently gone through leaving the church we have attended since I was a little girl. My husband and I were married there, he was baptized there, our son was also baptized there and it was the only church he had ever known. The transition to a new church was difficult and we are still adjusting but like you, we are so glad to have our new church family! So glad to hear the joy your family has with your own church! !